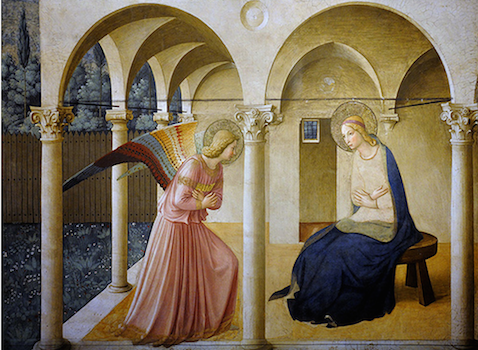 The Annunciation: The angel Gabriel visits Mary to announce to her that she will be the mother of God. At this moment, Jesus Christ miraculously conceived, and God is made flesh and blood. The Visitation: Mary and Elizabeth, who are cousins, meet. Mary is pregnant with Jesus and Elizabeth is pregnant with St. John the Baptist. Elizabeth (and her son in her womb) recognize the miracle of Christ in Mary’s womb. The Nativity: Mary gave birth to Christ in a stable while the animals watched. In works of art, Joseph, Mary’s husband, often sits off to the side and sleeps. 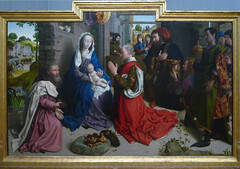 Adoration of the Magi: Three Magi (by tradition, kings from the East), follow a miraculous star that leads them to Christ, who has just been born in a stable. 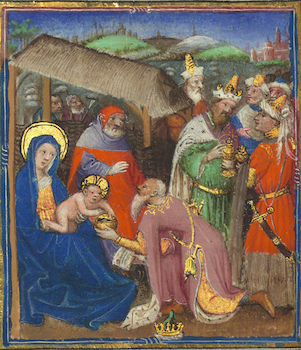 The Magi offer gifts of gold, frankincense, and myrrh (both are aromatic tree resins), and worship the infant Christ. The Presentation: Mary and Joseph present Christ in the temple at Jerusalem. They encounter Simeon, who was told by the Holy Spirit that he would not die until he had seen the messiah. 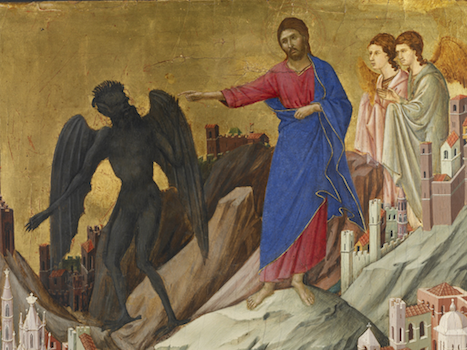 The Temptation: Satan visited Christ during his 40 day fast in the wilderness and tempted him to use his powers. In the third and final temptation, Satan asked Christ to worship him, which Christ refused to do. The Raising of Lazarus: This was one of the many miracles Christ performed that are recorded in the Gospels. Christ was friends with Mary, Martha, and Lazarus, who were siblings. Lazarus became ill and his sisters sent to Christ for help. 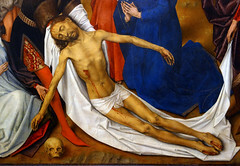 Lazarus died and was in the grave for four days before Christ raised him from the dead by calling him out of his tomb. 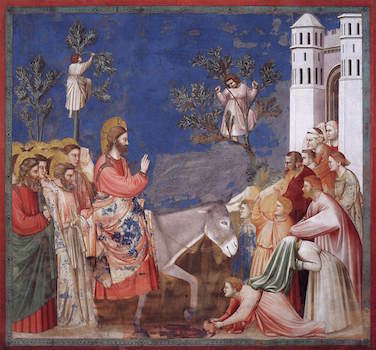 Entry into Jerusalem: Christ rode into Jerusalem on a donkey, where he was greeted by crowds of people. These crowds laid down their cloaks for him and waved palm branches at him, welcoming him into Jerusalem as their leader. 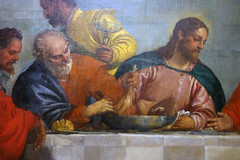 The Last Supper: Christ ate dinner with his apostles and encouraged them to eat bread and drink wine in remembrance of him. He also told the apostles that one of them would betray him. Agony in the Garden: After the Last Supper, Christ went to pray in the Garden of Gethsemane with his apostles. He asked them to wait and pray with him, but they fell asleep. Jesus prayed alone and bled from every pore. Kiss of Judas: Judas, who has been paid 30 pieces of silver to betray Christ’s whereabouts to the Roman authorities, leads them to him, and identifies him with a kiss (or an embrace). 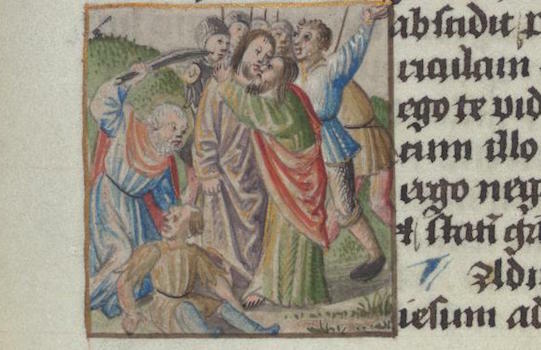 Christ is arrested by the Romans. 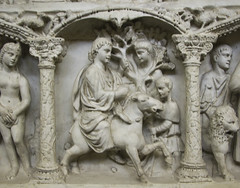 Christ before Pilate: Roman soldiers take Christ to Pilate, the Roman prefect. Pilate tries Jesus, but does not find him guilty. Pilate tells the angry crowd that he will release one prisoner, but they do not choose Jesus. 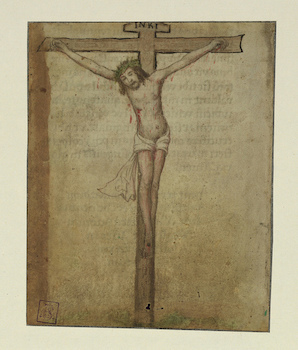 Pilate orders Christ to be whipped and crucified. 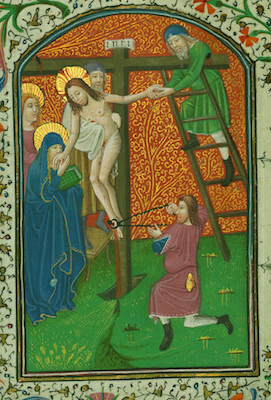 The Crucifixion: Christ is crucified at Golgotha as his mother Mary and the apostle John watch. Jesus is offered vinegar and soon dies. He is stabbed with a lance after his death. Pilate gives Joseph of Arimathea permission to take the body of Christ off the cross. Joseph places the body in a tomb and rolls a large stone over the door. Pilate orders guards to watch the tomb. 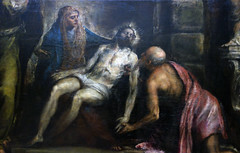 Descent from the Cross (also known as The Deposition): Christ’s body is taken down from the cross by Nicodemus and Joseph of Arimathea. They bring a shroud for the body. 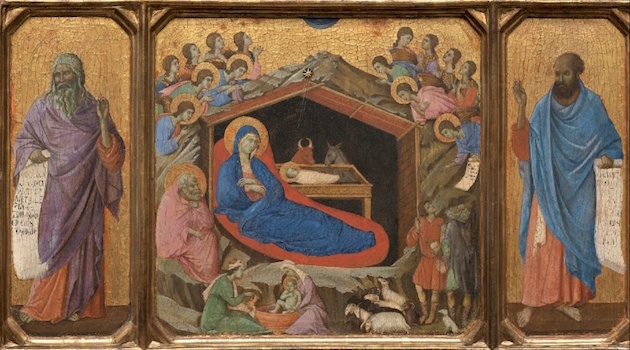 Other figures often included in representations of this scene are the Virgin Mary, St. John the Evangelist and the three Marys (three women mentioned in the Gospels as followers of Christ, all named Mary but not including the Virgin Mary, Jesus’ mother). The Marys at the Tomb: In one tradition, the three Marys were Mary Magdalene, Mary the mother of James, and Mary Salome, in another, they were the three daughters of St. Anne. They went to the tomb to wash and anoint the body of Christ, but when they got there, the large stone was rolled away from the door. An angel tells the Marys that Christ is not there. 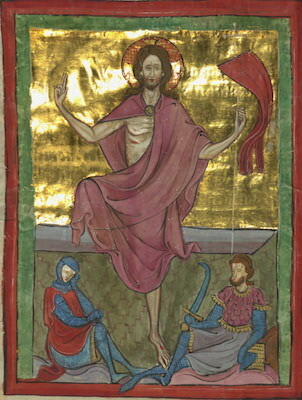 Throughout the Middle Ages, this scene signaled the Resurrection of Christ. The Resurrection: Christ emerges triumphant from the tomb and carries the banner of the resurrection, a white flag with a red cross. This scene was first developed in Early Renaissance art. Noli me Tangere: Mary Magdalene went to the tomb to mourn Christ. She finds Christ, but initially mistakes him for the gardener. When Mary realizes that he is Christ, he says “Touch me not” or “noli me tangere” in Latin. The Ascension/Pentecost: After forty days with his followers, Christ ascends into heaven. As he does this, the Holy Spirit descends on them, an event known as Pentecost. 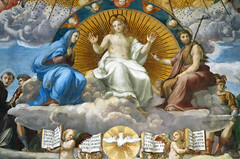 Last Judgment: Christ is often represented in art as judge at the end of time. These scenes often show Christ enthroned in heaven surrounded by apostles and angels, who help him judge the souls of humankind. Good Christians go to heaven, a beautiful orderly place, and the damned go to hell where they are tormented for eternity. Cite this page as: Dr. Nancy Ross, "Standard scenes from the life of Christ in art," in Smarthistory, August 8, 2015, accessed April 24, 2019, https://smarthistory.org/standard-scenes-from-the-life-of-christ-in-art/.